Hanshi John Kraemer was born, April 3rd 1942 in Irvington, New Jersey and lived in Caldwell until he was seventeen years old. As a youth, Hanshi Kraemer ran with a rough crowd and had several brushes with the authorities. At the age of seventeen he moved to California, changed his ways, obtained his high school diploma, and later attended College in Santa Anna until 1962. By that time he had earned an Associate Arts degree in electronics. Hanshi Kraemer is not opposed to citing his own experiences in his teaching sessions. "I chose my friends unwisely and now I teach the opposite: choose your friends wisely and make good decisions," he says. Later in 1962, he enlisted in the U.S. Air Force. He stayed in the Air Force until 1966 having reached the rank of E-3, working high towers and pole line construction. When he left the military in 1966 he moved to Oregon and began a career in electrical wholesale for the next sixteen years. 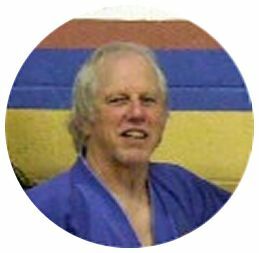 In 1976 he then moved to Washington State where he lived and worked for another four years before moving to Junction City, Oregon where he would meet and make friends with Hanshi Vance Steele. In 1980 Hanshi John earned his private pilot license along with a real estate license. This same year, Hanshi Vance approached Hanshi Kraemer to try Karate. Hanshi Kraemer spent the next three years training with Hanshi Vance in ShinPu-Ren. They worked out in his garage, at the park, and anywhere else there was room. The workouts were very strenuous with lots of leg work. In fact many of the class recruits would only last a month due to the intensity of Hanshi Vance's classes. By the time Hanshi John had his brown belt, he was allowed to teach his own classes in Lake Quinault. In 1983 Hanshi John was promoted to Black Belt and soon after moved to Montesano. He was now 44 years old. He began working out and practicing his karate in a local park to attract potential students, and by the end of his first month he had ten new students. Hanshi John operated his dojo in Montesano for five years before moving his main dojo to Aberdeen, Washington. He taught here steadily for five years before branching out. Over the next fifteen years, he would teach in six different locations besides his main dojo. Hanshi also maintained a family and raised seven children during these years. Hanshi John had begun studying other styles by this time and earned his green belt in Aikido from Renshi Frazee and in 1994 Hanshi had also earned a Black Belt in Tae Kwan Do from his instructor Doug Hinsley. Hanshi was well aware early on that not utilizing the best techniques of multiple styles would limit a student's ability to accelerate in their learning. Therefore, through the years he has spent enormous amounts of time training and studying other systems to improve his teaching of ShinPu-Ren. He uses a variety of styles to enhance his classes such as Aikido, Kempo, Tae Kwan Do, Ju Jitsu, and Hapkido. Over the years Hanshi John began the process of training himself in weapons. He would watch other martial artists and then incorporate his observations into the ShinPu-Ren kata's using his chosen weapon at the time. He studied any written materials by the Masters that would aid him in his search for knowledge. Over time he became proficient in Kama, Sai, Nunchuku, Tonfa, Bo and also gained good proficiency with sword. Hanshi John had a successful tournament career for eighteen years, retiring from competition around year 2000. Hanshi is not one to back down to adversity and challenges in teaching, as is demonstrated by the number of students he has worked with over the years who have faced just that and much more. Working with students confined to wheelchairs, students missing limbs, students with Down syndrome and many others. Hanshi has taught over 6,000 students over the years and has said he would never let adversity stop him from teaching and passing on his knowledge. Hanshi John over the years has promoted over 33 black belts. He learned not long after the first few black belt promotions that due to a lack of understanding his black belts would stop training because of the mistaken idea that there was no more to learn. To stop this trend quickly, he implemented the training for his black belts in the Go Ju Ryu system of kata's. This would give them continued seasoning time to realize that their journey in the martial art's had only just begun. In 2004 Hanshi Kraemer was inducted in to the Pacific Northwest Hall of Fame. He also received a lifetime achievement award from the Northwest Martial Arts Association. These awards were unexpected by Hanshi and he was very honored to have been selected to receive them. Since he began teaching in his own schools, Hanshi has maintained himself as member of the Christian Martial Arts Association. Hanshi John also blends his Christian beliefs into his classes. He uses his spirituality to lead his students by example. Teaching students to develop control over their physical and emotional reactions, through the tolerance learned in the martial arts, encouraging his students to believe in themselves and to work hard to develop their potential to the best of their ability. At this time, Hanshi John still teaches in his main dojo in Aberdeen. Washington. He also runs classes in Ocean Shores. He has always been supportive of his black belt students who have gone on to run their own classes or Dojos. He is currently the head of the ShinPu-Ren system, overseen only by Hanshi Vance Steele. Hanshi John travels yearly to offer support and leadership to the ShinPu-Ren schools that fall under his direction. Students and instructors look foreword to these visits aware of the value of the knowledge and insight that will be imparted to them. These visits also lend a deeper credibility to the ShinPu-Ren system itself. Hanshi John's long term goal is to continue to teach and help prepare youth for life physically and mentally. To always keep connections with his students strong, helping them grow to be what they want to be, and to always offer support to those students that want to teach. "He doesn't break people. He emphasizes making it your own personal thing. Not every body can do 100 push up's the first time on the floor: not every one is good at memorization. It's a physical challenge; it's a mental challenge. He would make you challenge yourself".